First of all, a big Thank You to those of you who stopped by our booth at the Northwest Women's Show, or attended our Celebrity Cruise Night! We really enjoy connecting with our clients in person, and in this internet age, we don't always get the opportunity to do that...so we sincerely appreciate the connections we made at those two events. We are hoping to do similar events in the future. And if this is your first time receiving our newsletter, WELCOME! We are happy you joined us, and hope that your find this information interesting. Please know that, unlike many newsletters, the address this comes from IS monitored, so if you reply with a comment or question, we will get it, and respond. 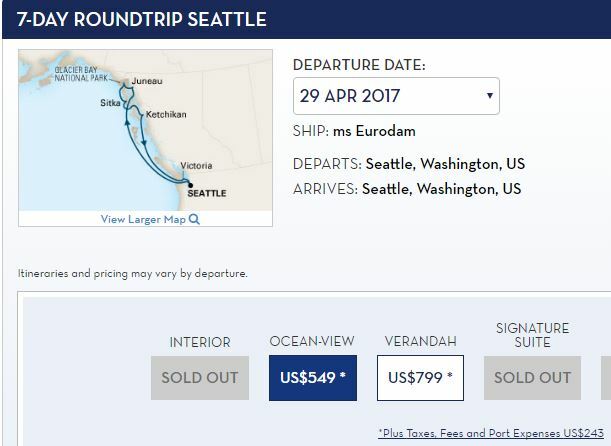 Seattle remains one of the best places to embark on a memorable Alaska Cruise, and right now, several cruise lines are offering GREAT deals on Summer 2017 cruises, especially in May and early June. A bear photo safari. Yes, that's right, bears! Head out with a guide to the Spasski River, where coastal brown bears can often be found enjoying a salmon lunch, and observe from concealed platforms. The worlds largest zipline course, featuring six, mile-long ziplines cruising at 300 feet above the rainforest, and dropping 1330 feet in altitude. The White Pass & Yukon Route railway, built in 1989 during the Klondike Gold Rush, climbs nearly 3000 feet in just 20 miles, and features breathtaking views of mountains, glaciers and gorges, waterfalls, tunnels, trestles, and wildlife. 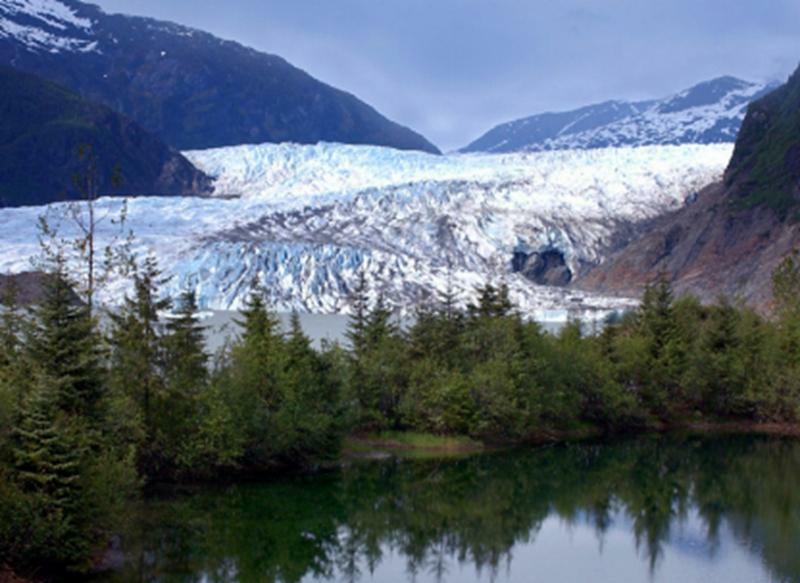 Go for a hike on the famous Mendenhall Glacier, just outside of Juneau, with all gear and training provided (physical fitness required, though). If you enjoy sport fishing, there are options for both both deep water (halibut) and fly-in river fishing (char, trout, and salmon). Even with no snow, visit a musher's camp and have the sled dogs take you for a ride on a wheeled sled. If you're lucky, there will be puppies to cuddle! Or you can take a helicopter up to the glacier and go dog sledding from there. That's just a few of our top picks, there is so much more! Whale watching, kayaking, gold panning, float the river on a raft, go sightseeing by sea plane... the list goes on. And of course, there's the spectacular scenery surrounding the ship for duration of the cruise. You can spend hours just sitting in the observation lounge and watching for wildlife--whales, dolphins, eagles, bears, moose, etc. Or splurge on a balcony and enjoy the view from the comfort of your stateroom! We've collected some great deals on Alaska cruises below, but some of them will only be available for a few days, so please take a look and contact us soon! Thank you for reading our newsletter! Please call us with any questions or suggestions, we always enjoy hearing from our clients, 425-827-5656, or toll free at 1-800-275-9876. P.S. -- Thank you to all of you who "liked" and "shared" our Professional Travel Service, Inc. Facebook page, we really appreciate it! If you haven't yet, please do so. WOW!!! If you are a "drop and go" kind of person, Holland America has an Alaska cruise leaving Seattle THIS Saturday, and you can be on it! Call today, not sure how long those last cabins will be available! 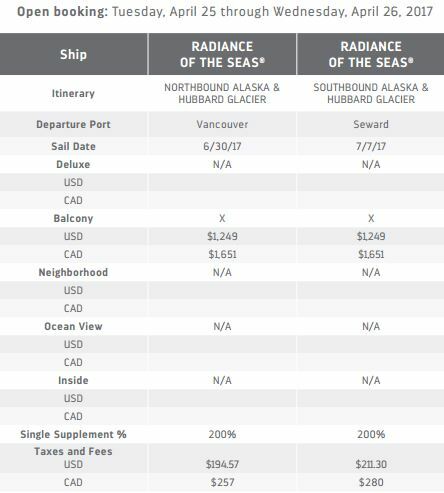 RCCL is offering amazing rates on balcony cabins for two of its one-way cruises this summer, Vancouver to Seward (Anchorage) and reverse. 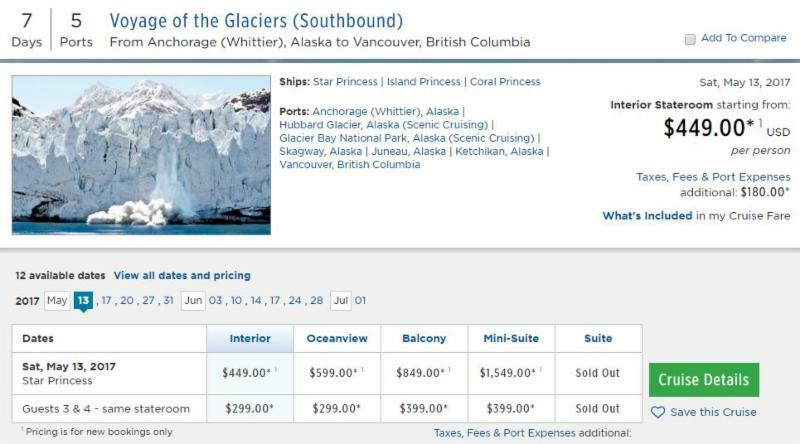 Princess Cruises is offering amazing rates on a May 13 Southbound voyage from Whittier (Anchorage) that visits both Hubbard Glacier and Glacier Bay! Two to choose from: a Tracy Arm cruise on the Solstice (round trip Seattle), or a one-way Hubbard Glacier cruise (Seward to Vancouver). Seabourn returns to the Alaska market after a 15-year hiatus! Visiting out of the way ports as only a small ship can. All inclusive! Consider adding a pre-cruise land-tour to Denali National Park! Okay, not an Alaska cruise, but check out the last-minute availability with Cunard, including the classic Transatlantic crossing.